Throughout this most entertaining series we have been treated to stories of not only a historical view of King Richard’s reign, but also stories of unrelenting passion, and anguished souls. 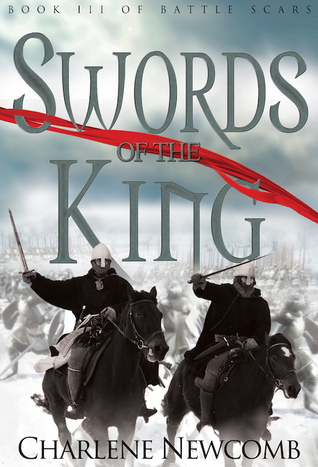 In Swords of the King the author tackles the question of who will Richard choose as his heir and successor; his brother, the ever loving, faithful – oh wait, Prince John was never those things, or his nephew, the young and arrogant Arthur. Calling upon his favorite knights, Richard uses Lord Henry De Grey, Sir Stephen, and our old friend Sir Robin Hood to help him keep Arthur safe from the not so loving and faithful Prince John. Of all the Prince John characterizations I have come across, this one is certainly the nastiest; a formidable foe bent on revenge for any who dare cross him – something that could mean disaster for Richard’s favorite knights. Note: I received a review copy of Swords of the King in exchange for an honest review. Charlene Newcomb lives, works, and writes in Kansas. She is an academic librarian by trade, a former U.S. Navy veteran, and has three grown children. When not working at the library, she is still surrounded by books and trying to fill her head with all things medieval. Books I & II of the Battle Scars series are B.R.A.G. Medallion honorees; Book II was a finalist in the Chaucer Awards for pre-1750 Historical Fiction & recipient of numerous accolades. Char is a huge Star Wars fan and has contributed short stories to the Expanded Universe featuring an underground rebel freedom fighter, http://starwars.wikia.com/wiki/Alexandra_Winger. Char loves to travel, and enjoys quiet places in the mountains or on rocky coasts. But even in Kansas she can let her imagination soar. Find her on Facebook, Twitter and her blog. The Lancastrian revolt is over. Those who opposed the King are now outlaws and are being pursued with a vengeance. This is especially true for Robin Hood and his men as they are once more wolf’s heads high on the list of the King’s main huntsman, Sir Guy Gisbourne; The Raven. In this, the second volume in Steven McKay’s series on the famed outlaw, the author has crafted a tale of intrigue, bravery and betrayal. He has also continued the development of his characters, the old and the new. In particular his portrayals of Little John and Will Scarlet have gone up a notch as they help Robin overcome some very nasty treatment at the hands of Sir Guy; one of the new characters who the author has imbued with a streak of super-villain like viciousness. The action is exciting, well thought out and is interspersed with many touching scenes…e.g. Sir Richard at Lee and his captor, a relative nobody from the village. The detailed descriptions of the forest scenes lend a nice touch to this exciting sequel. I heartily recommend this series and look forward to the third book. My rating for this is 4.7. My second book, The Wolf and the Raven will be released on April 7th, get your pre-order in now and come meet me at the London Book Fair between April 8-10!I was born in 1977, near Glasgow in Scotland. 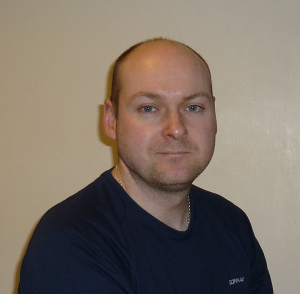 I live in Old Kilpatrick with my wife and two young children. After obtaining my Bachelor of Arts degree I decided to follow my life-long ambition and write a novel. Historical fiction is my favourite genre, but I also enjoy old science-fiction and some fantasy. 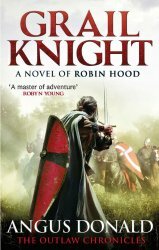 Bernard Cornwell’s King Arthur series was my biggest influence in writing “Wolf’s Head”, but I’ve also really enjoyed recent books by guys like Ben Kane, Glyn Iliffe, Douglas Jackson and Simon Scarrow. I play lead/acoustic guitars (and occasional bass) in a heavy metal band when we can find the time to meet up. As this is the fourth book in this most excellent tale of Robin Hood, I sort of knew what to expect and was not disappointed. This chapter revolves around King Richard’s attempt to drive King Phillip of France out of Normandy but there are plenty of other side stories and subplots as well. Alan Dale is once again the narrator and in this tale is also one of the main characters as he struggles to find the real reason his father was killed and who the responsible party was. Along with that he is also dealing with a curse levied at him and his bride to be. The author has produced a magnificent tangle of twists and turns while also continuing his deepening of Alan’s character. Alan suffers much agony and pain, physically, emotionally and spiritually during the many and varied adventures he takes part in during the course of this tale not the least of which is his concern about his own guilt in the deaths of so many he encounters in his quest for the truth. This is where the author shines in my view as he brings that pain and agony to the reader almost as if it leaps off the page as you read the words. One of the big events, one that will carry over to the next book in the series is the introduction of The Holy Grail. This most revered relic of Christianity plays an important part in Alan’s quest and serves as a catalyst for Robin to pursue this relic and possess it. Thankfully the sequel, Grail Knight, is already available so I won’t have to wait too long to continue the pursuit. I heartily rate this volume at 4.7. I really enjoy ‘discovering’ new authors and thanks to the Twitterverse I keep ‘discovering’ them. 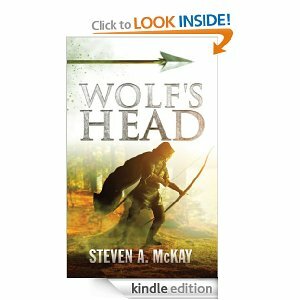 One note – by new I don’t necessarily mean brand new, but rather, new to me although in the case of Steven McKay both cases apply as Wolf’s Head is his debut novel. The author chose to write about Robin Hood, a subject that has been written about by many, most notably Angus Donald but this shouldn’t deter you from checking out this version of the forest outlaw. The author has set his story in a different time period than the usual one that pits King Richard against Prince John. This tale of Robin and his band of outlaws takes place in the 14th century during the Lancastrian rebellion against King Edward. The cast of characters will be familiar to most, John Little, Friar Tuck, Will Scarlet are all accounted for as well as a host of others. The story is about how Robin became an outlaw and how he gains the admiration and respect of the gang. The action is non-stop for the most part and kept me turning pages as the author punctuates the scenes with enough twists and turns to make the outcome of each encounter doubtful. The author also paints the landscape and villages in such a way as to make you feel like you are there, the mind’s eye taking in the descriptions and making them real to the reader. I won’t go into too much detail as to how the plot unfolds, suffice to say that the story is exciting and invites the reader to sit back and enjoy the journey through the forests and villages of northern England. I look forward to the sequel and beyond from Mr. McKay with great anticipation as he has whetted my appetite for more. Hoover Book Reviews rates this book at 4.5. The farther I go in this series the more I am convinced that Angus Donald’s Robin Hood is by far the best portrayal of this legendary man I have come across. Couple that with his story telling ability and you have a must read scenario. In this volume, King’s Man, Alan Dale finds himself labeled a traitor by seemingly everyone around him from Robin to Prince John to an old lover and even his good friends Marie-Anne and Godifa. Things on the home front at Westbury where Alan is ensconced as Lord of the Manor and from where he is telling this tale as an old man, are also not as well as they could be. The story has as it’s backdrop the attempt by Prince John to replace his held for ransom brother, Richard, as King. While the deal making to set Richard free proceeds ever so slowly, John and the despicable Ralph Murdac consolidate their hold and power over the land and Robin finds himself an outlaw in Sherwood once again. The action is relentless, the intrigues are many and the introduction of some especially nefarious characters make for a very enjoyable read. Most of you will already know the historical outcome of this royal sibling rivalry between John and Richard but I bet you haven’t read as interesting a take on this event as you will by reading King’s Man. With his band of men. Feared by the bad, loved by the good. Robin Hood, Robin Hood, Robin Hood. Oh that catchy tune from the old Robin Hood TV show starring Richard Greene. That was the Robin Hood I grew up with. 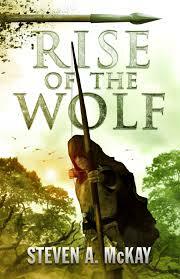 That is not the Robin Hood of this magnificent series by Angus Donald. In this, the second book, Holy Warrior, we find Robin and his merry men as part of King Richard’s retinue on Crusade to free Jerusalem from the Saracens. This despite Robins total disdain for the Christian Church but as a man of honor he is bound to his word. Once again the tale is told in the voice of Alan Dale, personal musician or trouvere to Robin as well as one of his most trusted advisers. Alan is an old man as he recounts his adventures with Robin. I really enjoy the way the author has Alan not only reminiscent but also has him paint his life as a respected Lord of a manor. This also affords Alan a chance to bare his soul about some of the horror he has witnessed or even helped commit. The first part of the book revolves largely around Robin and Alan stuck in a siege by Christians against Jews in York. The climatic finish to this chapter is just one more grim reminder of the dangers of dogmatic religious hatred. The author does not shy away from the portrayal of the brutality and malice born of the fear and ignorance of the peasantry and also of the greedy, glory seeking nobility and church. Twas indeed a brutal time to be on the wrong side of bias. Assassins, intrigues, you name it, the author has it going full blazes throughout the story. The characters of Robin and Alan reveal more and more of their true selves during the course of this second installment. It will be of great interest and pleasure to discover how these two survive not only the perils of the age but also the perils of their differences.